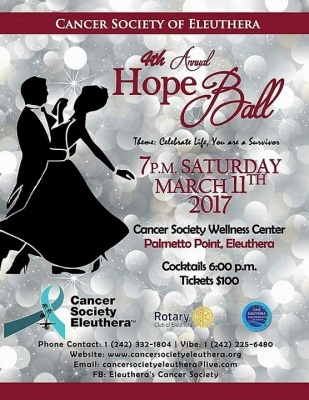 The Cancer Society of Eleuthera will be holding its 4th Annual Hope Ball on Saturday, March 11th, 2017. Cocktail hour will commence at 6:00 pm and the main event to follow at 7:00 pm. Organisers promise that it will be “a beautiful night”. Themed as “Celebrate Life, You are a Survivor”, the event will take place at the Health & Wellness Center located on Queen’s Highway, Palmetto Point, in Central Eleuthera. “This year we are seeking to connect and partner with families and church families and local businesses on the island of Eleuthera who have been affected by cancer first hand,” shared The Cancer Society in a release. For this grand occasion they have scheduled a dynamic Master of Ceremonies, Mr. Matthew C. Rolle I, out of Nassau, Bahamas. A selection of planned entertainment include: the famous Freedom Marching Band; 2 talented local soloists, Malikah Pinder and Lateka Culmer who will serenade guests with their beautiful voices; a touch of comedy by the Master of Ceremonies, a very young and talented trumpeter from Nassau, Matthew C. Rolle I; disc jockey Philip Bodie and; a talented spoken word artist, Shelly Elisee. There will be ‘prizes and more prizes’. Delicious food and dessert will be served. Tickets are available at the Health & Wellness Center’s office in Palmetto Point. Contact the Cancer Society of Eleuthera for more information: call 332-1804; email cancersocietyeleuthera@live.com; web www.cancersocietyeleuthera.org.